Hello, dear readers! I know it’s been ages since last I posted (about the demise of our beloved Manse Cat, Sieste), and I apologize for my absence. But there is a reason for it: I have been over-the-top busy with a project that I took on in my role as secretary of St. Andrew’s United Church here in Queensborough. And tonight I’m going to tell you a little bit about that project, and don’t you dare yawn at the prospect. It is a project that has taught me a lot about how small rural communities work, and about how good work quietly gets done in them. So there. But first, an invitation! This coming Sunday, May 31, is the 125th anniversary of St. Andrew’s, and any and all of you who are, or would like to be, in the general vicinity of Queensborough are very welcome indeed to come and join us in a service of worship celebrating that remarkable milestone. The service begins at 11 a.m., will feature special musical performances, and will – this being Queensborough, where you always come away well-fed – feature a lunch afterward. St. Andrew’s is at 812 Bosley Rd., just up the hill from the Manse. As a lead-up to that century-and-a-quarter milestone, yours truly decided that the church’s historical roll and mailing list should probably be updated – the latter mainly because, as I reported a while back here, Canada Post has become reluctant to deliver mail that is addressed only to a rural-route number (as opposed to an actual “street address,” which is kind of a funny thing to talk about in rural areas where there are no “streets.” Here we call those street numbers “911 numbers,” since with the advent of 911 emergency service came a number for every home and property. Modernization! Anyway. 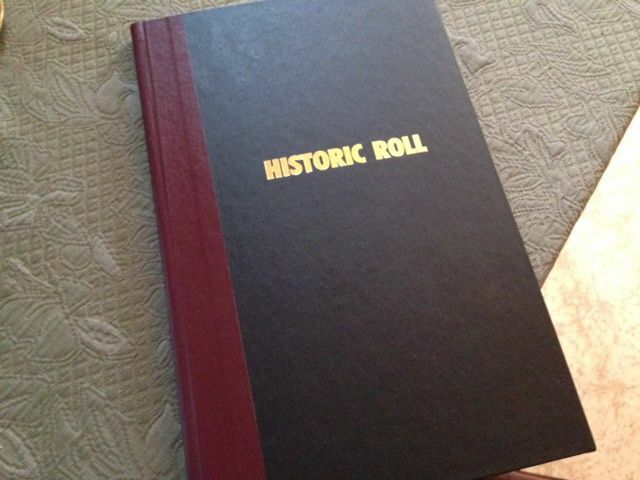 A church’s historical roll is an important document, because it records everyone who has ever been a member of that church. Names are never removed from a historical roll; if a member dies, or transfers his or her membership to another church, or asks to be removed as an active member, that information is recorded – but the fact that the person was once a member is always preserved for posterity. And meanwhile, the information for people who remain as members has to be updated as their lives and circumstances – addresses, spouses, etc.– change. Many, probably most, churches struggle to keep their rolls up to date, because in the 21st century people move a lot more often than they did when the whole idea of historical rolls was born. Also, in those days larger churches would have had a paid staff person to look after such records, and smaller churches had volunteer workers who could and did devote endless time to keeping on top of the records. These days, paid church staffers are a rarity, as are volunteer workers with any amount of spare time – and so many churches’ membership records are a bit of a disaster. Now, the records at St. Andrew’s were far from a disaster; in fact they were probably in better shape than those of many churches. But it was time for an update, especially because of that Canada Post mailing rule that I’ve already mentioned. And so I thought I’d just tackle that little project. Which, I soon realized, was a way bigger project than I had expected. One problem was ascertaining who people listed on the rolls actually were. I mean, there were many names I recognized from my childhood here at the Manse, when my father was the minister here; but many people had come and gone since then. (It was 1975, not exactly yesterday, when my family moved away from here, after all.) Many of the names were unfamiliar to me, though as it turned out one reason for that was women who’d changed their last names upon marriage. Quite often during my research I’d have an a-ha moment, as in: “Aha! That’s (so-and-so) Devolin! or Cassidy! or Alexander! or Holmes! – or whatever was the woman’s maiden name, under which I’d known her when she was a girl or young woman all those years ago. And then there was the matter of figuring out where people who, when their names were entered on the rolls, had “Queensborough” or “Cooper” or “Eldorado” or “RR# Whatever,’ listed as their address, actually are now. Some of them are still in the same places, but we needed a 911 number to be able to contact them by mail; and many others had moved to other addresses altogether, near and far. What a job it was tracking them all down! And then once I’d recorded everything I had gleaned from that session (which was a lot), I realized there were still some holes and some missing addresses and information. And so I would call up people and pick their brains and ask who else I could call. And so often those people volunteered to make the calls themselves, to help me out. I spent a lot of time on Canada411 trying to track down addresses and phone numbers; and I used email and Facebook and anything else I could think of to try to find people. It took a lot of time. There were a lot of phone calls. But those phone calls, those conversations – some with people I’d known ever since my childhood; some with people I’d never spoken to in my life before; some with people I’d known a little bit but hadn’t talked to in years – were revelatory, and wonderful. I learned so much. It wasn’t just getting to the bottom of the proverbial “Where are they now?” and thus being able to contact the church members. It was connecting the dots, so to speak; in many cases putting faces, or at least information (“daughter/son of so-and-so, lives in such-and-such a place now, has become an insert-profession-here”) to what had before then just been names on the list. And everyone I spoke to, even those who said things to the effect of “Gracious, I haven’t been in the area for ages; you should take my name off the list!” was so kind and helpful, and, I sensed, a little pleased to hear from a representative of the church of which they had once been a part. Those conversations made the work so very rewarding. The absolute best part of the work was learning about the things people are doing to help St. Andrew’s that I hadn’t even been aware of, even though Raymond and I are very active members of the congregation. 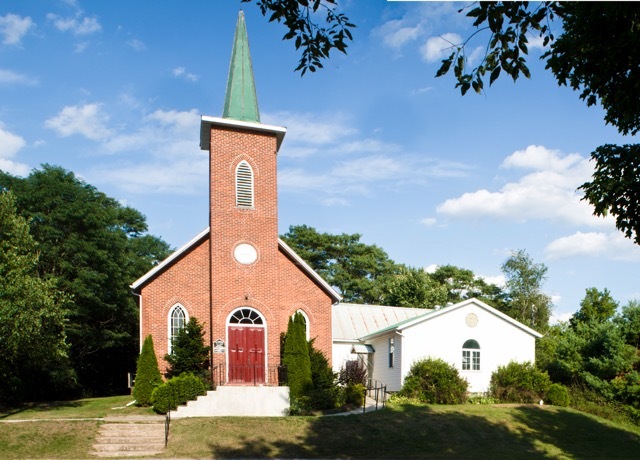 For instance, I learned about how, every time there is a Ham Supper or a Turkey Supper at our church (major fundraisers for its work, and also important social events in Queensborough), a long-established network of communication goes into high gear. Calls are made: “Could you make a salad? Scalloped potatoes? Baked beans? A dessert?” They can, and they do. Or if they can’t, they make a financial donation instead. And they in turn call their friends and neighbours, inviting them to help out, to support the event, to attend and enjoy it. Many – most – of these people don’t come out to Sunday services at St. Andrew’s. But they remain attached to the church, remain committed to supporting it in many different ways. So my exercise in getting the church membership roll updated, and by extension getting myself up to speed on who is who and where they are, turned into a bit of an education about community and how it works. Which, it turns out, is: quietly. Without any fuss. But with a deep sense of commitment to the connections of the past and the present. And with hope for the future. 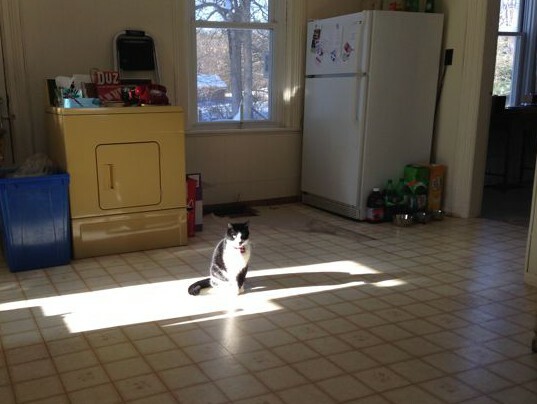 I took this picture of Sieste in a pool of sunlight in the middle of the Manse’s kitchen several months ago, and I’ve always liked it. I was saving it for a good time to share it with you. This evening seems like that time; Sieste died today. The Manse is a very sad place. It’s been a while since I’ve posted here at Meanwhile, at the Manse. I’ve been busy with other community projects, all of them worthwhile. But tonight I have to interrupt that worthwhile work to share with you some very sad news. It is this: Sieste the Cat, easily one of the most popular characters here at Meanwhile, at the Manse, is no more. 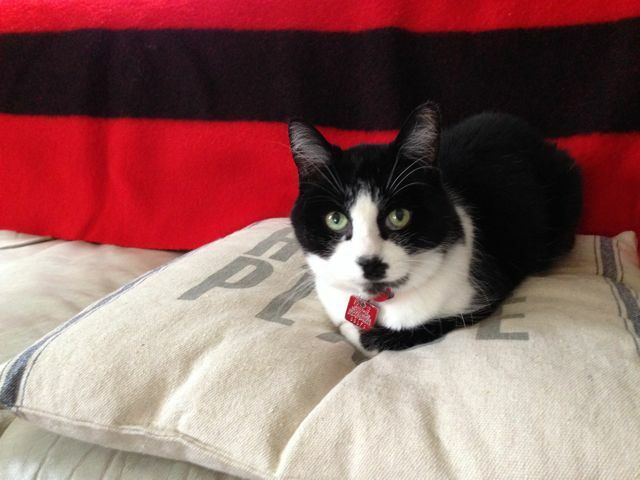 The cushion says, “This is my happy place.” And this is our happy cat on it, not very long ago. I am pretty sure that from my many previous posts about Sieste – like here, when I wrote about her Big Move to Queensborough from Montreal, and here, when she took on the role of the In-and-Out Cat, and here, in which she was Queen of All She Surveys, and here, in which her daily routine at the Manse had become thoroughly established – you could tell how much Raymond and I loved her. She has been a part of our family since we have been a family, and a very important part. Raymond and I both love cats, but I think it might be safe to say that we loved Sieste best of all. She died quietly today, after being ill for just a few days. She was old; while we don’t know her exact age (we adopted her from the SPCA), our best guess is 18. That’s not too shabby for a cat. While she’d been showing signs of age and some frailty for the past year or so, she was 100-per-cent her smart, full-of-beans, affectionate but independent-minded self right up until three days ago. Over those three days she quickly became weaker and less able to control her bodily functions, and at midday today her body quietly gave out. It was a blessing. We hated to see her so ill, and I am sure she hated being so ill. But she was still our old Sieste to the end. In these last days she always acknowledged us when we came near to her bed, and purred when we stroked and cuddled her, which was often. She did her best to get up and follow us around when we were in another room, as she always has. And here is the best story of all, one I will not be able to write for you without sobbing. As I mentioned in this post chronicling Sieste’s daily routine here at the Manse, for a long time it was her habit to come upstairs early each morning and yowl at us when she thought it was time to be up. Which tended to be half an hour or so earlier than we actually needed to be up, half an hour before the non-feline alarm clock would sound. Many were the mornings when we would sleepily curse at this too-early wakeup call from Sieste, even while we (of course) always continued to love her and appreciate the fact that she wanted us to come and hang out with her at the start of a new day. Sieste hasn’t done the early-morning wakeup for the past couple of months or so, probably because she was just getting elderly and tired. Those steps can be hard for an old girl to climb, especially the high, steep ones ones in the Manse’s back staircase (as opposed to the front staircase; and why there are two staircases is an interesting question). 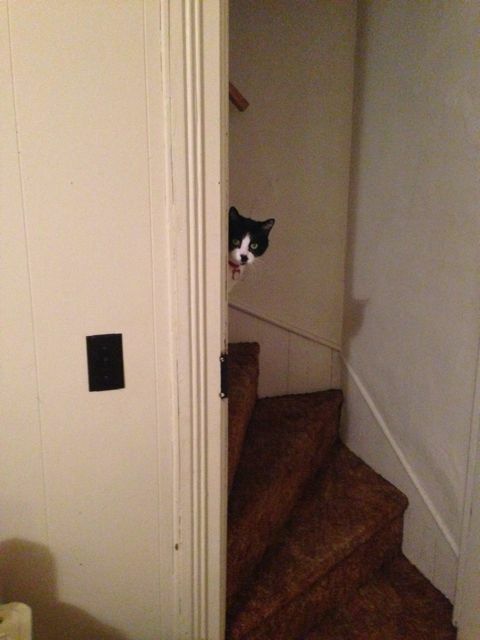 But frankly, Raymond and I weren’t complaining about the lack of early-morning yowling. Last night we stayed up quite late with her, as she lay in her bed in the dining room downstairs, just beside where I am writing this now. She was very weak and obviously fading quickly. She could hardly move, and when she did try she could not go even a step without wobbling, often falling over and having to lie where she’d fallen. We knew she was almost gone, and it was hard to say goodnight. I set the alarm for 7 a.m., when I had to get up to go to work. At 6:30 on the nose, there came a quiet, familiar yowl from a familiar place. Sieste playing peekaboo a few months ago, on the same steep staircase that she climbed one last time this morning. Sieste the cat, who was failing so quickly and had absolutely no strength left, had somehow climbed those steep old back stairs at just the right time (that is, half an hour before the alarm was to go off), lain down in her familiar old position as the sun was rising, and issued one last wakeup call to her people. I spent a lot of time with her this morning in that place at the top of the stairs, stroking her and telling her over and over again how much we loved her and how much we appreciated the morning alerts. Which in general was not exactly the truth; but on this morning, it was the truest thing ever. What a good, brave girl to have forced her dying body to do it one last time. It feels so strange to be finishing this post without Sieste perched either on the living-room chesterfield (where she could keep an eye on everything) or on the hassock right beside me (where she could keep me close company). She was always an excellent assistant for Meanwhile, at the Manse. The Manse feels very lonely tonight. And very quiet. Raymond and I buried Sieste late this afternoon. Her final resting place is beside the clothesline pole, a place that sees lots of action by her clothesline-loving mum (me). I will think of her every time I hang the laundry out and take it in. I know she would like that. 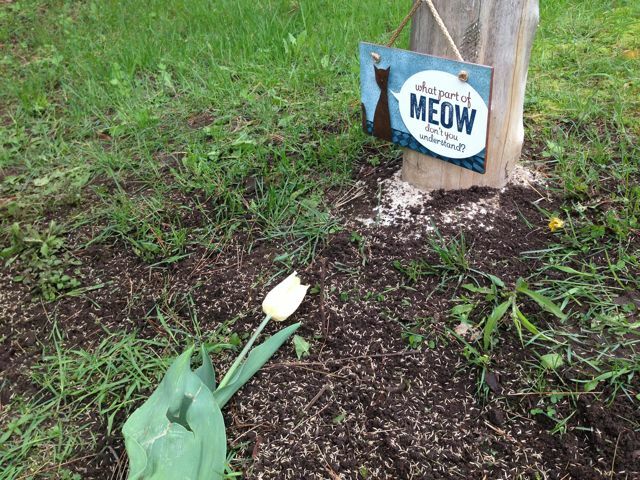 Here is her grave, with a tulip from our garden and a scattering of some Madoc Mix grass seed – the latter the subject of a future post. Which I will have to write without Sieste’s help. Our good pussycat. Our good girl. Never was a cat more loved. Well, people, tonight I have yet another invitation for you to a fun community event that is happening this very weekend in Queensborough. And as is our wont here in Queensborough, it involves – food! (We know how to feed people. For evidence, check out my posts here and here and here and here.) And not just good food. Great food! The Queensborough Community Centre, which will be overflowing with people this coming Sunday morning, all enjoying a great pancake breakfast. 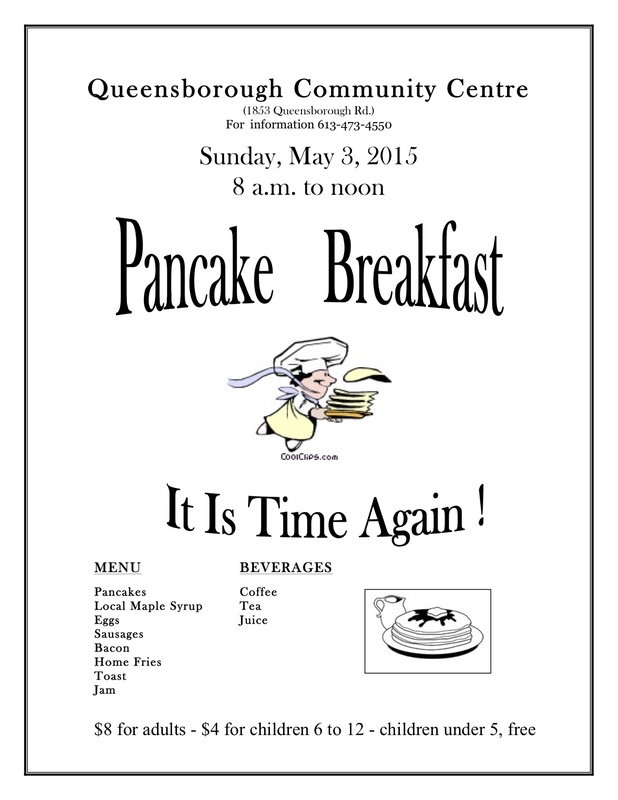 Here’s the deal: This coming Sunday morning, May 3, is when the annual Pancake Breakfast takes place at the Queensborough Community Centre. You can learn everything you need to know regarding time and place and menu and price from the poster that I’ve put at the top of this post. What you really need to know, though, is that it’s just about the best pancake breakfast around. You’ll be surrounded by friends old and new, from the Queensborough community and beyond, as you enjoy fresh locally made maple syrup with your pancakes and sausages and eggs and toast and whatnot. 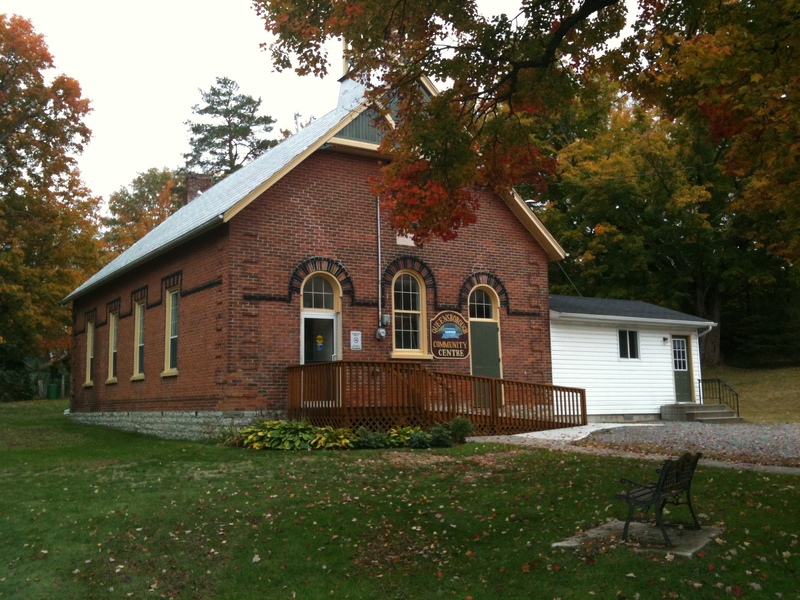 And all in the historic surroundings of Queensborough’s former one-room schoolhouse. And your admission fee will go to help the great work that the Queensborough Community Centre Committee does. Is your appetite sufficiently whetted? I know mine is. I hope to see you on Sunday morning!